You can charter just one car or the entire train for your party or event. Rent a passenger car with seating for about 50 to 60. Or rent our first class dining car with seating for up to 40. You can depart from the station in Walkersville, or we can pick you up or drop you off at Walkersville Community Park where you can enjoy a picnic lunch before or after your ride, if you so desire. A range of cost options is available, depending on your needs. 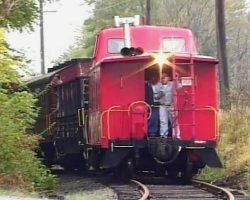 A very popular option for kids' birthday parties is our "Little Red Caboose", the perfect setting for a Birthday Party!!! The caboose will comfortably hold up to 22 people, and is available for chartering year 'round. On regular runs during our excursion season (May-October) the price is $300 and during unscheduled times, off-season, and during special event trains (Bunny Trains, Steam Trains, Santa Trains) the price is $350. When you charter the caboose, you have exclusive use of it for the designated date and time. We will decorate the caboose and provide a colorful tablecloth for the small table that is available for your use. There will be a railroad crew member available to see that your needs are met and to monitor the activities from a safety standpoint. We strongly urge that children be seated at all times the train is moving. It is acceptable for the adult(s) in charge to move about the caboose to serve drinks, food, etc. The ride is approximately one hour and 10 minutes. After about 35 minutes, we will stop the train at the end of our line for a few minutes to prepare for our trip back to the station. This is a good opportunity to allow the children to move about the caboose and to blow out the candles, serve cake, sing "Happy Birthday," etc. When everybody gets situated again, we will be on our way for the trip back to the station. Feel free to bring your own lunch, snacks, drinks, balloons, etc. Engineer hats, bandanas, whistles, etc., are generally available for purchase from our Gift Shop on regular excursion days. We trust that you will adhere to the safety rules that are pointed out by railroad personnel. And we trust that you will be respectful of the work that has gone into restoring the railroad cars and to monitor the children accordingly. Dates and times for all charter activities are subject to crew and equipment availability. Our general administrator will be happy to help you plan your perfect event. Click on the Contacts link to e-mail our general administrator.